Surely not, you say!? Oh yes, don’t think we’ve finished with you just yet with our week full of birthday giveaways ’cause here’s another one – and it’s all thanks to the delightful publicists at Sony Music. This is one big pop package of six lovely latest release pop albums from the Sony Music staple, all lovingly brought together for our fourth Birthday Giveaway. 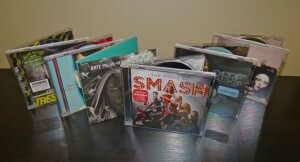 Yes, one fab prize pack, six fab pop albums! And it could be yours… if you shoot through an entry to us. As always (we’re sounding like a broken record this week) send us an email containing your name and postal address to our address up top in the sidebar. In the subject line for this prize, however, include the term “Perfect Sony Pop Pack” in the subject line and we’ll squidge you into the draw! Done! Competition closes at 10:00pm AEST on Thursday June 07, 2012. Only one entry per residence will be accepted. Open to Australian residents only. Winners drawn entirely at random. Winner’s first name, suburb/town and state will be published on the site on Friday June 08, 2012. One lucky sod is going to receive this entire package of fabulous Sony Music pop albums, with thanks to their sparkling publicity team. Your deets are safe in our loving care. We fan them occasionally and feed them grapes from above.